On April 9, Colin Haley and Sarah Hart, taking advantage of an open access road that saved them 10 miles of skinning and 2,500 feet of elevation gain, nabbed a new 1,000-foot route up Colfax Peak (9,440'), a sub-peak of Mt. Baker above Bellingham, Washington. Their route, Kimchi Suicide Volcano (M5 R AI4+), climbs over volcanic rock and up sparse cracks, and follows discontinuous ice into a narrowing chimney followed by a tunnel. The day of the climb, the team left their car at 6:30 a.m., gained 1,000 feet of elevation through the forest, then skinned 4,000 feet up the Coleman Glacier and reached the base around noon. 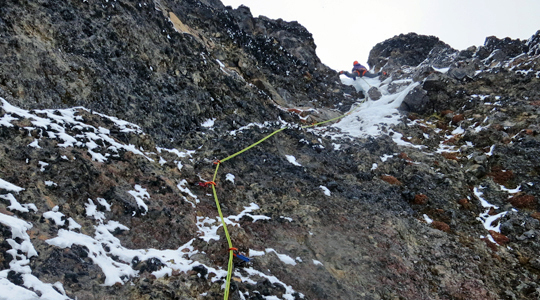 Their route consisted of five roped pitches, protected by cams, nuts, pitons and ice screws. The highlight of the day was finding and then wiggling through the 15-foot tunnel, which they didn't know was there until after Haley climbed through much of the chimney and saw light coming through from the other side. Haley and Hart surmounted this obstacle with their back on one side and legs pressing against the other. From here, the route summited via snow slopes and neve, which the two simulclimbed. They stood on top 6:30 p.m., walked off the back of the peak and returned to their car by 9:30 p.m. The mixed climbing was "like Smith Rock but with blobs sticking out," Haley says. "[The blobs] look suspect but are totally solid." Smith Rock, Oregon, made of welded tuff and rhyolite, is riddled with pockets and knobs. 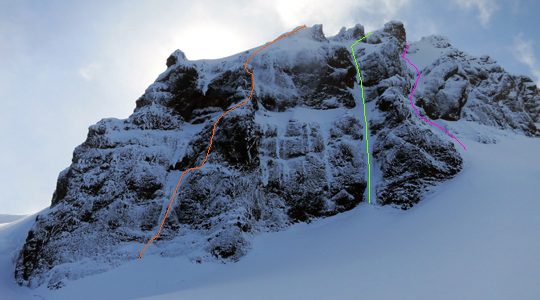 Kimchi marks the third route on the north face of Colfax. The other two are the Polish Route (WI6, 1000', Rogoz-partner, 2000) and the moderate Cosley-Houston (WI4, ca. 700', Houston-Cosley, 1982). 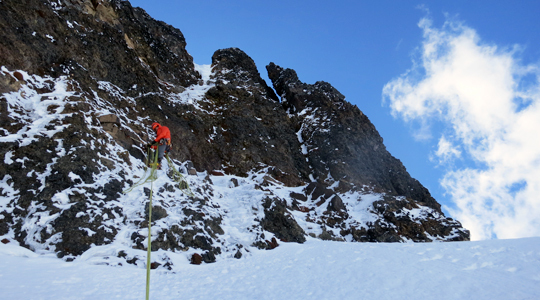 The Polish Route contains a hanging dagger and has been repeated only four times, three of them this winter, Haley believes, beginning with Will Hinckley and Braden Downey in mid January. 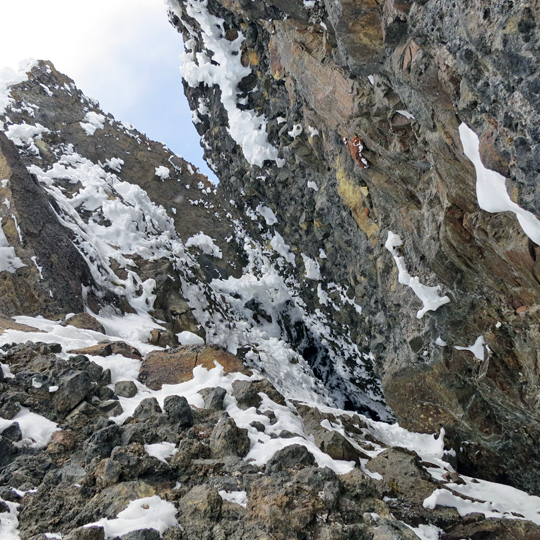 On March 6 of this year, Roger Strong and Doug Hutchinson made their ascent of the Polish Route; it was Strong's sixth attempt since 1997, as not until now had he found the hanging dagger to be in condition. Haley and Hart also climbed the Polish Route on the same day. Because of the long approach, most teams climb Colfax in the autumn before snow covers the access road, but this year it saw traffic throughout the winter because the road stayed open. "These ridges [on Colfax Peak] may possibly be the walls of an extinct crater, whose vast hollow is some two miles in length by about the same in width," states The Alpine Journal, Volume 5. "At the point of intersection of the above-mentioned ridges, but beyond it (a vast field with neve filling the intervening space), rises the great peak, entirely snow covered." 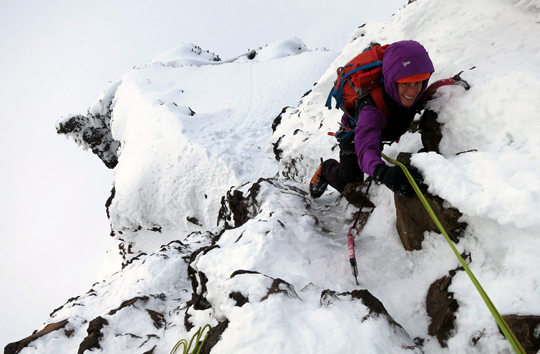 Haley adds, "The special thing about Colfax... is that it's so high quality compared to other winter climbing in the Cascades. Colfax has this high-alpine ambiance to it, but with steep, technical climbing. It has this combination of easy access and reliable ice conditions... tons of real blue ice over. It could be in the Alps or the Canadian Rockies." Because of Colfax's lofty height, and since it faces north and is near the ocean, it receives moisture. Mt. Baker (native name: Kulshan) is a volcano, and Haley believes geothermal heat melts and forms water ice on the face and on the rock. "Nowhere else in the Cascades do you see such reliable waterfalls so high on the mountain," Haley says. It was fun to watch you two climb up this as we descended Colfax Peak that day. You guys did great as usual. Colfax is a great alpine objective.